This is the second in an occasional series that looks at UK rap, primarily, shining a light on those acts and twelves that got away… lost in the abyss that is musical history. One album and two singles, released in ’92, was all that the duo Brothers Like Outlaw wrote and then they were gone. Like Caveman, they came and went quickly but what did they leave us 21st-century rap fans? 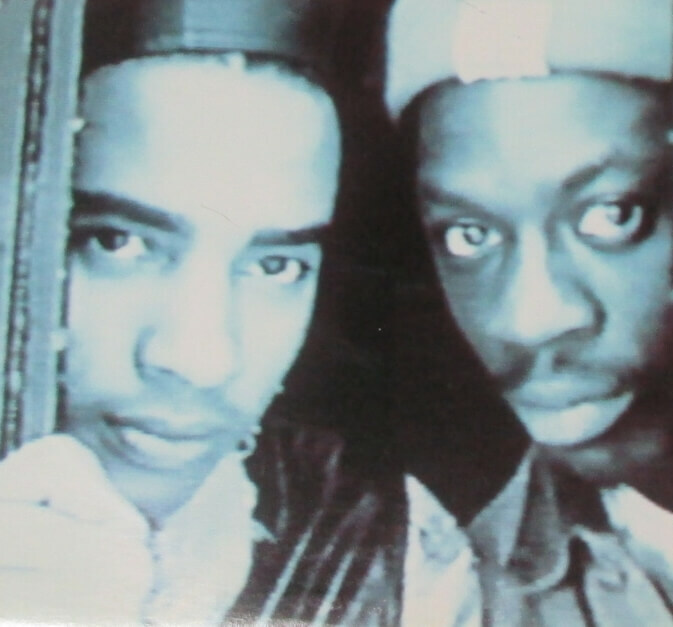 London-based Isaac Bello and Karl ‘K-Gee’ Gordon made up the group, who were formerly known as Outlaw Posse, having had a name change to avoid a lawsuit from American rockers with the same name. Trapped Into Darkness was the first single. A typical boom bap mix from Main Source mainstay producer K-Cut attracts the eye when checking the sleeve today, promising goodness, but it fails to deliver – an anonymous jeep cut which fades from the memory, instantly. Instead it’s the Femi Fem Enlightenment Radio mix that wins out, shoehorning in the beguiling organ from The Fez by Steely Dan. De La Soul had previously sampled the more sprightly Peg by the same band three years earlier and to better effect – a sign perhaps that Outlaw were a little slow out of the blocks and also too timid to make a name with their productions. Settle The Score on the B of Trapped Into Darkness is better though… a sedate recital about railing against the ‘devil’ and ‘making more cash than Bobby Ewing’, checking London soul gal Mica Paris and outlining ‘when I was inspired/I was living in Hackney’. The backing is little more than a twinkling Rhodes and a six-note section of the bassline from Keni Burke’s quiet soul classic Risin’ To The Top, but it has aged well (much better than the A-side and its preaching against selling cheeba. The video is shot outside a NY brownstone and the reference to ‘reminisce’ only makes you wish to hear T.R.O.Y. in full). Outlaw’s second single Good Vibrations has warm soul vibes and was featured with its predecessor on their only album, The Oneness of II Minds in Unison. Some highlights: The Struggle Continues samples Gil Scott Heron and Curtains by noodling jazz-funk fuser Jeff Lorber (doing his best Roy Ayers’ We Live In Brooklyn impression). As with Bristol producers Smith & Mighty (who used it in ’89 for Fresh 4’s Wishing On A Star), The Roots on their early’ track Proceed, Whitehead Brothers on Forgot I Was A G, Death Row’s Daz Dillinger and a million other copycats, The Real McKoy liberally uses the keys and hypnotising bass from Faze O’s alluring soul groove Riding High to good effect. Partytime meanwhile walked off with the rubbery bass notes – emanating from unheralded player Peter Garfield Maas – of UK early electro dabblers Freez’s Flying High. Outlaw had to pitch it down by about 20bpm before changing its key, but it still rocks (incidentally, last year Gilles Peterson and his Brownswood Recordings issued Sonzeira’s captivating version of Freeez’s Southern Freeez, with bass parts still present, as part of his label’s Brownswood 10 album of covers). Ultimately, De La Soul beat them to the Dan, cherry-picking the best break to lift. If it was a card game, their Prince Paul trumped K-Gee in selective, surprising and memorable sampling – not just once, not just one track, but. every. track. Compare Good Vibrations to their US peers Souls Of Mischief’s premier achievement, 93 Till Infinity: infectious rhyming about Bridget and the midget over George Duke’s melancholic keyboard line from Billy Cobham’s Heather. Throw in the obvious yet hugely effective drum break and it’s no contest, game over on the musical front. But then you admit that Pos and crew always came correct with relatively rapid and always infectious verses; Brothers Like Outlaw now sound slow and stilted in comparison – a little too polite and rigid in their desire to keep within the beats. So the end result? Some quality beats and usually interesting samples, but the vague subject matter and uninspiring mike delivery can be taken or left in the final analysis. Unlike Caveman, with their memorable productions that usually contained a sense of urgency, and the likes of Nottingham trio 3:6 Philly with their entrancing, minimal Funky Alcohol (released in ’92 on London house label Zoom), Brothers Like Outlaw chose to run with the crowd – not lead – and got trampled.